"Tampa's Lafayette Street bridge: Building a New South City"
in the Continental Army under George Washington. In Dec. 1963, Tampa City Council voted to rename Lafayette St. as Kennedy Blvd., honoring assassinated President John F. Kennedy, who had visited Tampa just a week before his death. 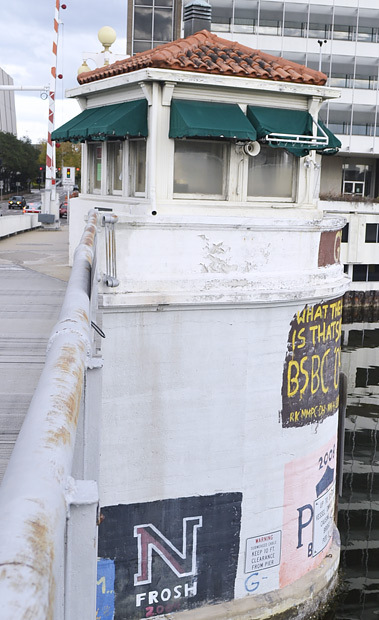 Tampa continued to grow throughout the twentieth century, and while many new bridges were built across the Hillsborough River, eventually the passage of time and thousands of vehicles each day left their mark on the Lafayette Street Bridge. 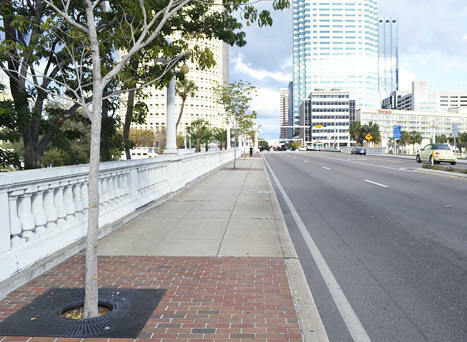 TECO stopped operating streetcars in 1947, and removed the last streetcar tracks in Tampa from the Lafayette Street Bridge in 1969. The caption reads: Take a good look at these Tampa streetcars. You won't see them after today. They will be replaced tomorrow with buses, ending more than half a century of service on Tampa streets. The cars go into the barn tonight to be sold to Central and South American countries to spend their last days "south of the border." The USF Special Collections On-line library has an excellent article on the history of streetcars in Tampa and St. Pete. This article shows the retirement date of the streetcars as 1949, but the Streetcar Society says 1946. It could be that from August 1946 to May 1949, the cars were gradually taken out of operation. Visit Tampa Streetcar Fest to see Tampa's restored streetcars, here at Tampapix. 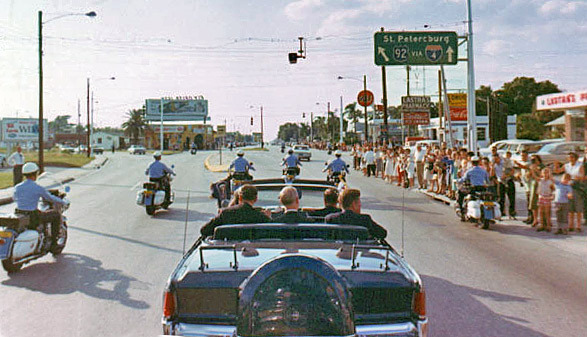 Lafayette Street, along with portions of Grand Central Avenue and Memorial Highway, was renamed Kennedy Boulevard in December 1963, honoring assassinated President John F. Kennedy, who had visited Tampa just a week before his death. 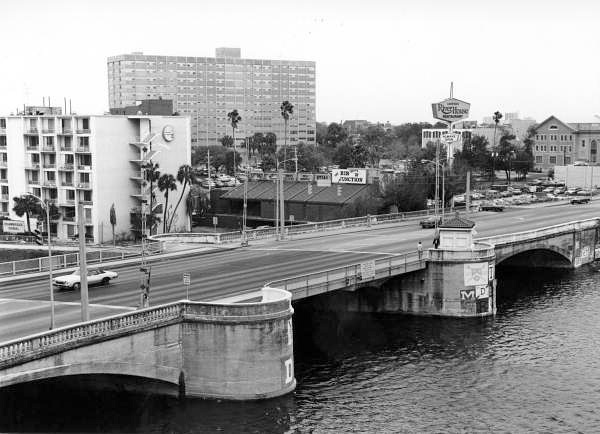 When City Engineer Wayne Jump was asked if the name of the bridge would change along with the street, he replied “If the bridge were named the same as the street before, it would seem it would follow suit now.” And so the Lafayette Street Bridge became the Kennedy Boulevard Bridge. Nov. 18, 1963 - President Kennedy in his motorcade as it passes through the intersection of Grand Central and MacDill Avenue, headed west. The intersection ahead is Henderson Blvd. In 1921, Grand Central was extended west of Howard Ave. all the way to the bay and then around the north of it to Pinellas County, and was named Memorial Blvd. (light blue section above) to honor Hillsborough County's 106 soldiers lost in WWI. A monument was placed at the intersection of Grand Central and Howard, and an identical one a the west end near the bay. 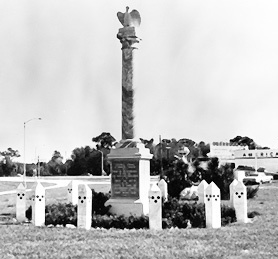 Cars soon collided with the monument at Howard Ave. and so it was moved to where it is now, the American Legion cemetery on the south side of Kennedy Blvd. just west of Dale Mabry. In the 1950s, Memorial Hwy. from Howard to the bay was renamed again, back to Grand Central Avenue, so that the name was once again consistent the entire length. The section of Hwy 60 that takes a turn to the northwest remained Memorial Blvd. In December, 1963, Lafayette St. and the portion of Grand Central west of its intersection with Lafayette were renamed Kennedy Blvd. A small stretch of Grand Central Ave. Still exists east of Brevard Ave. to the river. "May these trees you dedicated on the first Road of Remembrance in the United States live as long as the memory of the 106 you so finely honor." This was the message from the president of the American Forestry Assn. 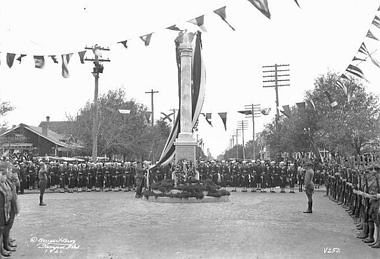 when Tampa dedicated its Memorial Highway to honor Hillsborough County’s World War I dead on January 2, 1921. The project was sponsored by the Rotary Club of Tampa. The planned asphalt road replaced a shell road from Howard Ave, then the City Limits, on Grand Central to the Pinellas County line. The 15-foot highway was 13.2 miles long and cost $870,000, and when opened was considered one of the finest highways in Florida. The Rotarians spent $7,500 for beautification, lining both sides of the road with water oaks and oleanders of several colors. The memorial where Kennedy Blvd. now becomes Memorial Hwy. The concrete pylons seen here surrounding the monument were originally evenly spaced along the highway between here and Howard Avenue. 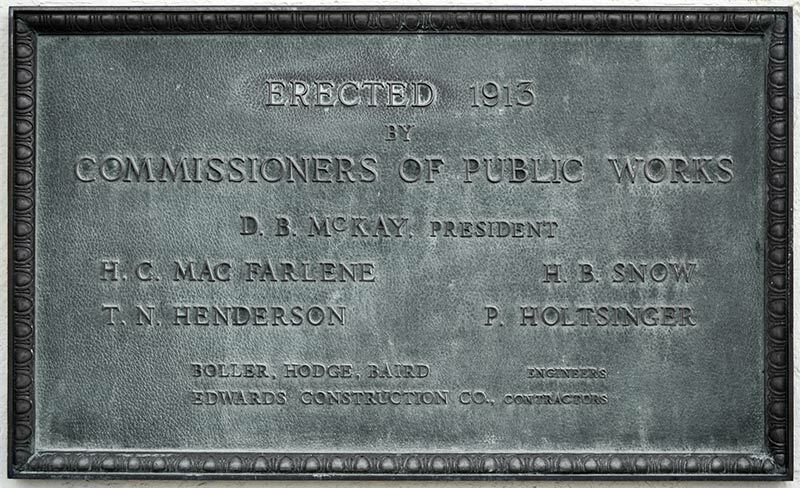 Dedication of the memorial at Howard Ave. & Grand Central, Jan. 1921. Tampa Tribune editor, E. D. Lambright, wrote the eloquent inscription that appears on the monuments. 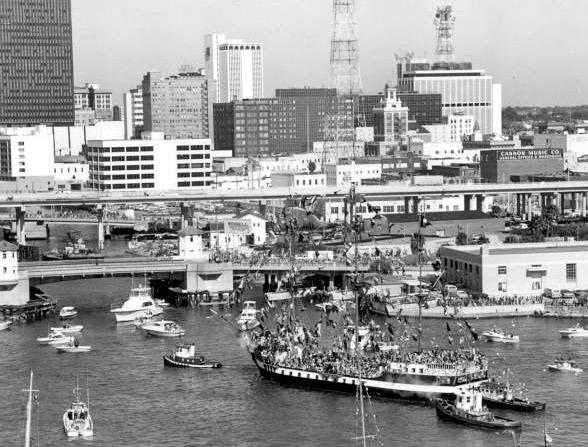 In 1975 the Gasparilla ship Jose Gaspar sailed under the Kennedy Blvd. bridge for the last time. The completion of the Crosstown Expressway across the river between the Platt and Brorein St. bridges put an end to the Gaspar's passage due to its 100 foot tall masts. In the late 1970s, overwhelming public opposition squelched a plan to replace the decorative urn-shaped balusters with modern steel rails. 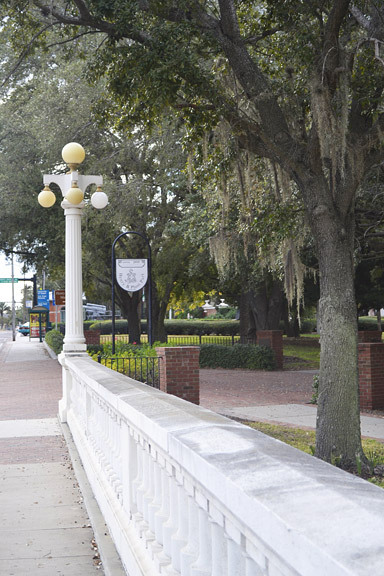 Florida Department of Transportation (FDOT) plans to widen the bridge in 1988 were scrapped when nearby business owners objected to land takings. FDOT budget cuts in 1989 delayed $216,000 worth of repairs. By 1991, FDOT was budgeting $2 million for 1994 to renovate the bridge, but by March 1993, the projected budget was up to $3.5 or $4 million, and by November 1993, the amount leapt to $6.2 million. FDOT personnel warned that the bridge would fall down in five years if not replaced. 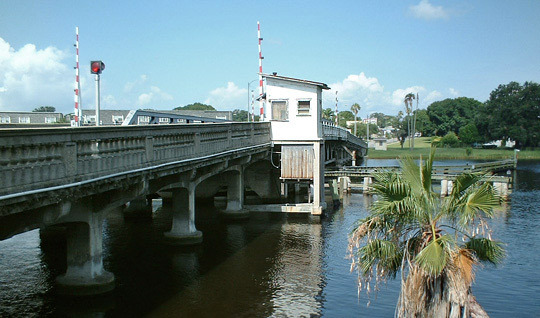 After considering several designs, with the input of engineers and historic preservationists, the Florida Department of Transportation (FDOT) put forth a proposal to renovate the bridge, retaining its original appearance. Despite taking nearly three years to finalize plans and hire contractors, the bridge closed for repairs on February 18, 1994. 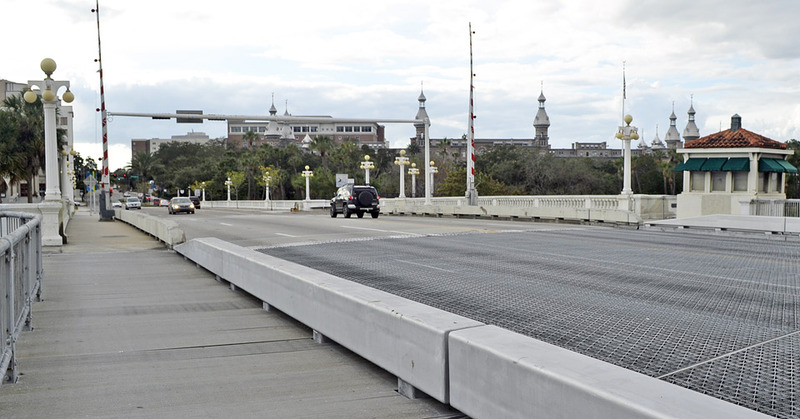 An estimated 26,000 cars and trucks used the Kennedy Boulevard Bridge each day, so FDOT had to reroute vehicle traffic over other downtown bridges. 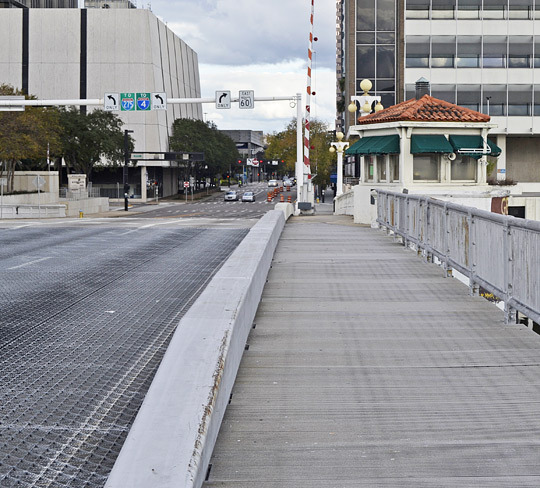 Nearly 2,000 people walked across the Kennedy Boulevard Bridge each day. For these pedestrians, FDOT considered running ferries, building a temporary footbridge, (sound familiar?) and even using a “cherry picker” to lift people up and over the water. These options were all rejected for reasons of cost and/or liability, so in the end the local transit authority (HARTline) ran free shuttle buses at ten-minute intervals using other bridges. As in 1913, local store and restaurant owners worried that they would lose money while the bridge was closed. The only difference was now those stores and restaurants were located on West Kennedy Boulevard on the west side of the river, rather than in the Central Business District on the east side of the river. As should come as no surprise to anyone familiar with the history of the bridge, it took three months longer than expected to reopen the Kennedy Boulevard Bridge. Mechanical problems, bad weather, and more deteriorated steel than expected all contributed to the delays. In recognition of the bridge’s historic significance and aesthetic appeal, engineers reproduced the original design as much as possible with replicas of the 1913 streetlights and the decorative balustrade. The bridge tender houses were restored, using paint analysis and historic photographs to determine the original color palette and awning designs. 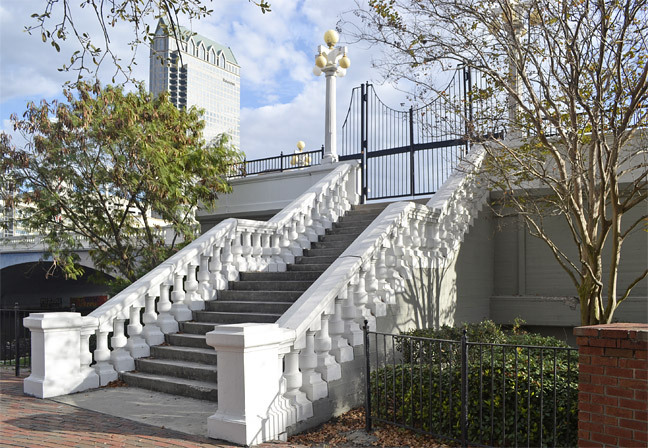 While the historic appearance of the bridge was retained, modern safety features were incorporated, such as thicker balustrades, non-slip surfaces on the walkway, and a concrete barrier between pedestrian and vehicular traffic. New arches with much more substantial steel reinforcement replaced the old arches that took so much time and effort to build eighty years earlier. It took three weeks to demolish the east arch, but the west arch fell in just one and a half hours. Before the bridge formally reopened, it was the starting line for the SNEAKer PEEK 5K and 1-Mile Fun Run/Walk, a fundraiser for the Multiple Sclerosis Society. A few weeks later, the bridge’s reopening ceremony was held on March 3, 1995. As a small crowd of one hundred people looked on, a busload of dignitaries drove through a paper banner to mark the opening. A dedication ceremony took place the next day in Curtis Hixon Park, the former location of the Henry Plant’s railroad depot, with Mayor Sandy Freeman calling the bridge a “door to downtown.” The ceremonies coincided with the Gasparilla Festival of the Arts, which took place that weekend along the riverfront between the park, the art museum and the performing arts center. 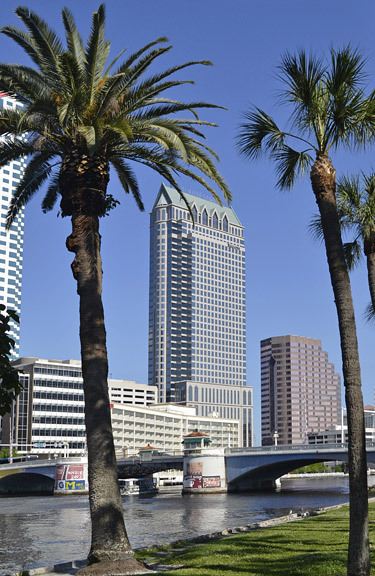 The refurbished bridge was but one of several major construction projects taking place in downtown Tampa, some of the others being a new hockey arena and the Florida Aquarium. 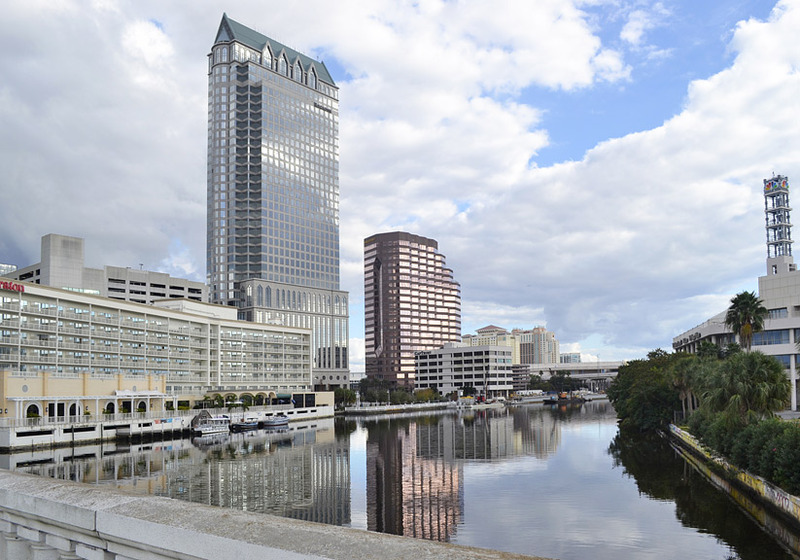 Collectively, these projects were intended to attract people to downtown Tampa outside of business hours. The Lafayette Street Bridge brings to mind few superlatives. 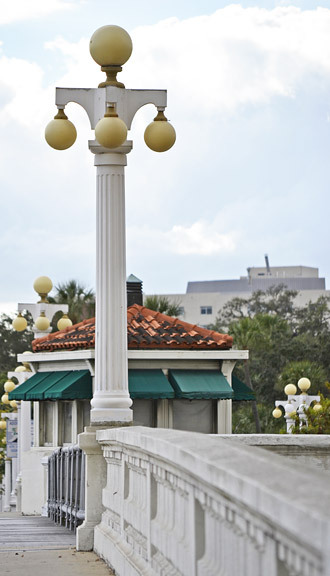 It is not the first, largest, oldest, most beautiful, or most unusual bridge in Tampa or Florida or the United States. It is, however, a strong and surviving physical manifestation of the people, beliefs, and events that shaped the city of Tampa, and as such has lasting value and significance. The physical shape of a city is both a result and an expression of the people who live there. Some choices that formed the city, especially those made individually, were not made intentionally, but where a house, factory, or bridge was built did shape both the city and how the city was valued. 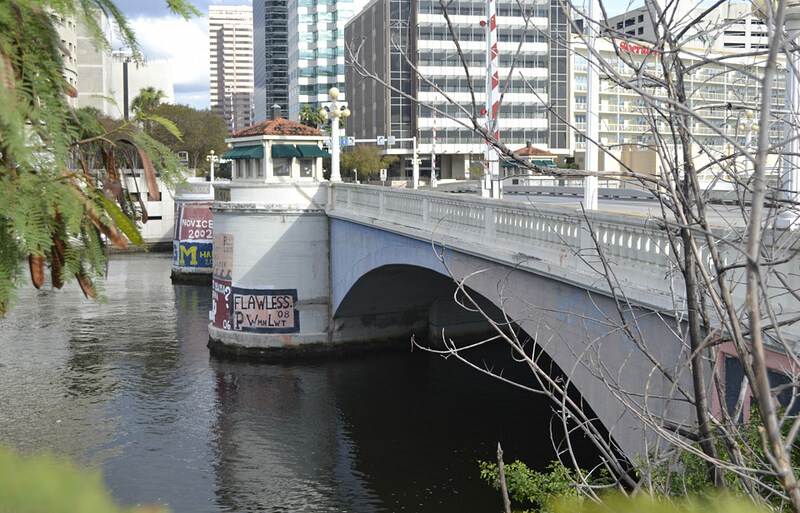 For Tampa, the Lafayette Street Bridge is a persistent reminder of how both the infrastructure and the political structure of the city came into being. Place your cursor on the photo to see the same view from circa 1905 from the 2nd Lafayette St. bridge. without having to walk all the way to the west end of the bridge. See photo below. 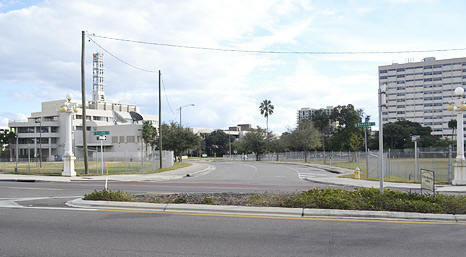 Looking south at Parker Street and Kennedy Blvd. 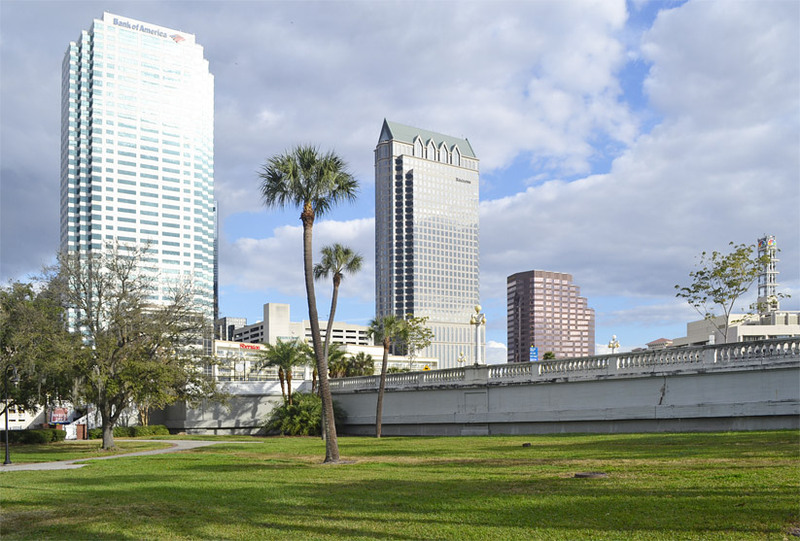 The City of Tampa plans to have artist Tracey Dear decorate four downtown bridges by August of 2012. At left is the artist's rendition of the Kennedy Blvd. bridge design. Read the story. 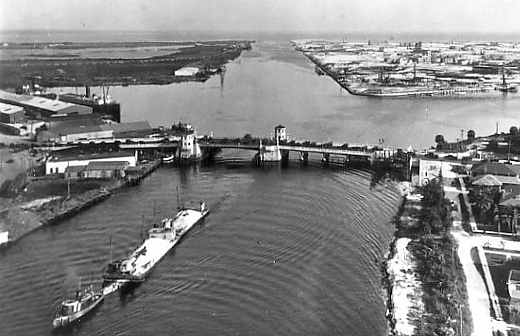 First Lafayette St. Bridge Second Lafayette St. Bridge Third Lafayette St. Bridge The Bridge Today - Kennedy Blvd.